The message on Ian ‘Fish’ Fishlock’s mobile phone goes something like this: "Hi, you have called Fish of Lumbar’s Transport in the big fish tank". The fish tank referred to is a Kenworth big cab K200 which Fish drives. After 40 years on the road, the big cab is the first time Fish has had the opportunity to drive a new truck from scratch, and he can’t hide the excitement in his voice. "It’s my first new truck in all my years on the road … my first brand new truck," he enthuses. "I haven’t had one before, so it’s like a new toy to me at the moment. "I’m 60 now and a lot of my mates ask why I didn’t get out, but the fact is I still love driving. "When they told me I was getting this thing, they said the smile on my face was unbelievable," he grins. Lumbar’s is based in Deniliquin in New South Wales and Fish has been with the company for eight years this time around. Previously, after spending nine years with Lumbar’s, Fish left to take up a job with Booths pulling tankers. Booths closed its depot in Deniliquin and, after Fish had surgery for a hernia, he went back to Lumbar’s for the second time. However, Fish says this time around, it’s far better and even more fun. 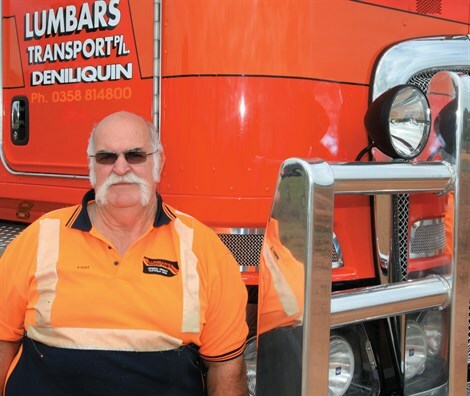 Lumbar’s Transport is run by brothers Frank, Eddie and Stan Lumbar who operate a fleet of 19 trucks providing an Australia-wide transport service. The Lumbar brothers are also into sprint cars and, back in the early days Fish would fly home for the race weekends to drive the race trailer to the arena. "It’s very much a family company. Most of our drivers are old school and there are a couple of younger drivers, but we’re like a big family and I enjoy that," Fish says. When Fish first started at Lumbar’s there were only three drivers, and he was behind the wheel of a little T-Line. 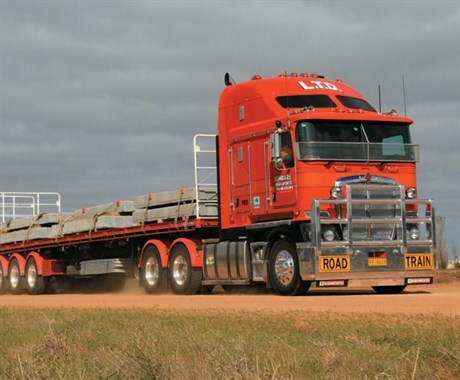 Lumbar’s Transport has slowly expanded over the years and today operates out of a new depot in Deniliquin. Included in its Australia-wide runs, Lumbar’s provides a freight service to and from Melbourne on Mondays, Wednesdays and Fridays. They used to do a daily run before the local abattoir closed down, although the rice mill is up and running again. "I came home on Friday with a full tautliner," Fish remarks. "There was a fair bit of freight and it took a while to load. "Usually there are a couple of forkies to help load but they had a day off … or something. It was hard work. I had to work my ring off yesterday but it’s part of the job. "It’s good when you have someone helping you. I can stay on the trailer and organise as they feed the freight to you. When you are loading on your own it can take three and a half hours, instead of one and a half." Fish says most of the Lumbar’s’ freight is "good freight". It’s just chain down and go. 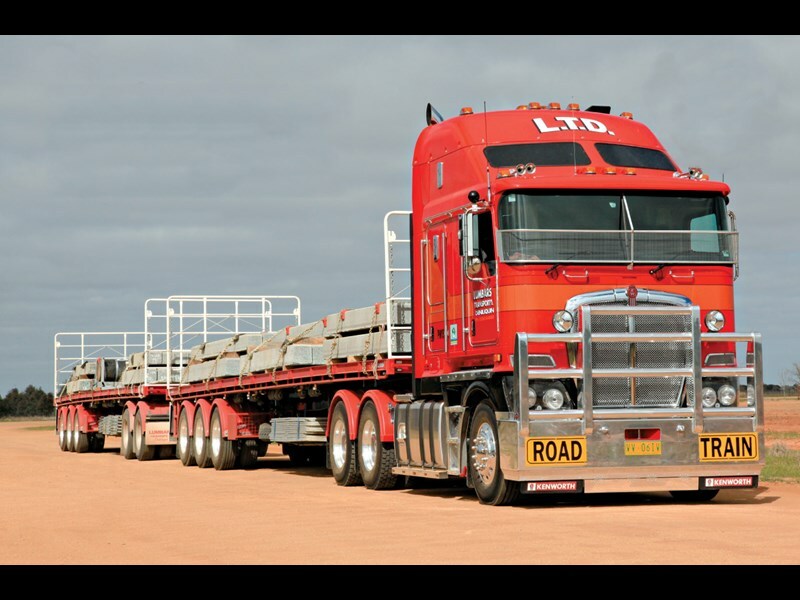 In addition, the majority of the runs take a week or more with all of the fleet being road train rated. The majority of the fleet is bonneted trucks, including a couple of Western Stars in the fleet, although there are the cabover Kenworths, which Fish prefers. "I absolutely love these things," he exclaims. "I’m not into bonneted trucks. I’ve driven Transtars and Western Stars here but I came out of a ’94 model Aerodyne. "I used to have to hop up, turn around and crawl into the bunk. In this one, it is only a matter of spinning around and moving into the bed. I can sit up and read on the edge of the bed, and I have a fridge near the bed and a TV." With two fridge freezers for storage, it’s perfect for Fish, especially as his fiancée, Jacquie, prepares enough frozen dinner packs to last a fortnight. "I take one out two hours before I stop for the night," he explains. "I pull up on the side of the road and cook it up. I don’t have to buy anything anymore and it saves a lot of money. 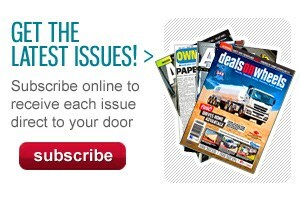 "On the last trip, to Townsville I spent a total of $55. I have a cold beer at night and then hit the hay." Long distance driving also means constant state border crossings, and it’s the varying regulations that Fish has an issue with. "The way I do my log books these days, I don’t start until seven in the morning and clock off at 9pm," Fish says. "I complete 12 hours and that’s enough for me. If I do 12 hours each day of the week, I’ve done a good job. "Eddie ensures that we get our rest breaks; we get 10 days to get to Perth and back. I can make it easy." Fish says in his younger years he never dreamt that one day he would be criss-crossing Australia. But even at age 10, he was driving a little six tonne Austin on the family farm. "My family were share farmers and I would drive the truck up to the big grain shed. It was bagged wheat. My father and grandfather would carry the bags up 32 steps and I would drive the truck in from the paddock," Fish recalls. The first big banger Fish drove around home (near Bendigo) was a Dodge with a bogie trailer carrying stock. "I got to drive bigger trucks and drive them further but then went back to a little truck delivering Coca-Cola around Bendigo for a few years. "It just snowballed and I just kept on going and going; it’s all just happened." As much as Fish was keen to get into the K200, he didn’t want an automatic. "Everyone knows their passions and I have always liked sticks." The K200 has the Cummins exhaust gas recirculation (EGR) engine under the bonnet and Fish says it performs well. "The pipes don’t get dirty and it’s very different to drive but it’s a great machine. It sounds like a V8 going down the road. "People ask me if I have a V8 in it but I just say it’s an EGR. "This truck is the pride of the fleet at the moment, but it still needs to get some chrome … a big chrome sun visor," he smiles. Fish says the great atmosphere at Lumbar’s Transport is what keeps him there. "We look after the township and the community; Lumbar’s Transport sponsors many things around here, including the footy clubs and the rodeo." He says the camaraderie between the drivers is another plus. "There’s ‘Pin Head’, ‘John Boy’, Mick, ‘Flappers’ and Tony; we all get on well and help each other out." Fish says it’s contrary to the industry in general these days. He says, with all the younger drivers around, there’s little care factor out there. "If you’re in trouble, they just drive past. It’s hard, especially running across the ‘Paddock’. "With some of those big companies you’re just a number. Many are running two-up, and that’s not my cup of tea. "Here it is — one man, one truck and that’s how it’s always been." 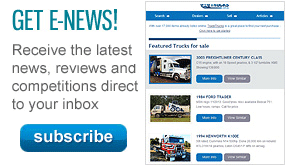 Search for new Kenworth K200 specs.